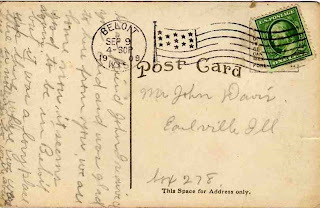 Another postcard sent by "Bella", a few months after she sent this one to her friend John. 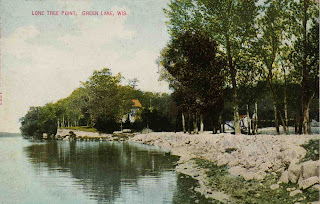 Green Lake's Lone Tree Point, on the current grounds of what is now the Green Lake Conference Center (or "the ABA" - American Baptist Association - that's what we called it). A circa 1940s hotel now stands near where the structure in the center of the postcard is. Lone Tree Point was named as such because of a huge cottonwood tree that stood at the point when the land was purchased by Victor Lawson, a Chicago newspaper publisher and co-founder of the Associated Press, in 1888 for $1429. Lawson had come upon the spot while seeking refuge during a storm that drove them off the lake in 1887. Eventually Lawson would end up acquiring hudreds of acres while establishing his estate prior to his passing in 1925. He's now buried in Chicago's beautiful Graceland Cemetary alongside such Chicago luminaries as Marshall Field, Louis Sullivan, Daniel Burnham, Cyrus McCormick and George Pullman. Okay, on to the back of the postcard. My take - Hmm, Beloit or Green Lake? Sure, GL is a sleepy little town of about 1300 (at least that's what it is now), but I'll take its natural beauty over Beloit's scenic, uh, Frito-Lay and Hormel factories. *my guess, I can't read the name.